Content, delivered in context to the right client at the right time, is the new competitive weapon in financial services. Boston, September 2, 2015 – Insurance agents and financial advisors need turnkey, personalized marketing capabilities that keep them compliant with the companies they represent. Firms are starting to recognize the value of automated distributed​ marketing platforms that provide local marketers with customized content, but less than 30% of U.S. insurance and wealth management firms currently use these platforms. If firms invest more in marketing automation solutions, can they catch up to the digital advisors that are already using these techniques? Based on interviews with marketing executives at U.S. insurance and wealth management firms and digital marketing platform vendors, this report discusses U.S. insurance and wealth management companies’ marketing capabilities and plans for cross-channel marketing platform investments. 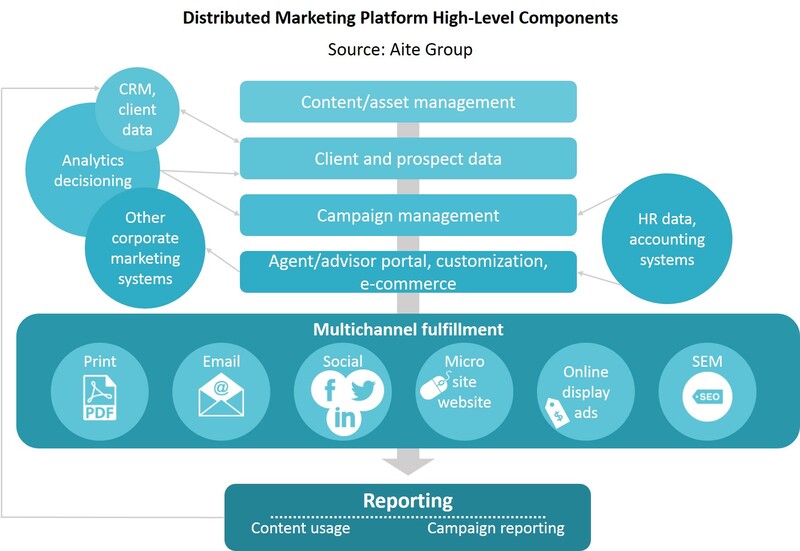 The report discusses the technical capabilities of a DM platform and overviews eight providers: Adobe, Balihoo, Brandmuscle, Direxxis, Distribion, EarthIntegrate, MarcomCentral, and Saepio. This 29-page Impact Report contains five figures and four tables. Clients of Aite Group’s Wealth Management, Life Insurance, or P&C Insurance services can download this report.